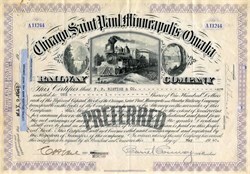 Beautifully engraved certificate from the Chicago, Saint Paul, Minneapolis, and Omaha Railway Company issued in 1947. This historic document was printed by the Franklin Bank Note Company of NY and has an ornate border around it with a vignette of a vintage locomotive. This item has the signatures of the Company's officers, and is over 68 years old. The Chicago, St. Paul, Minneapolis and Omaha Railway or Omaha Road (reporting mark CMO) was a railroad in the U.S. states of Nebraska, Iowa, Minnesota, Wisconsin and South Dakota. It was incorporated in 1880 as a consolidation of the Chicago, St. Paul and Minneapolis Railway and the North Wisconsin Railway,. The Chicago and North Western Railway (C&NW) gained control in 1882. The C&NW leased the Omaha Road in 1957 and merged the company into itself in 1972. At the end of 1956 CStPM&O operated 1616 miles of road and 2396 miles of track; that year it reported 2115 million net ton-miles of revenue freight and 65 million passenger-miles.